Fully qualified doctor employed by the practice. My working days are: Tuesday, Wednesday and Thursday. I provide General Medical Services, along with minor surgery and steroid injections at the surgery. My interest is in Dermatology, having worked as a Speciality Doctor in Dermatology at Tameside General Foundation Trust's skin cancer clinic for over 10 years. I also currently work for NHS England as a GP Appraisal Lead for Tameside and Glossop, along with being a GP Appraiser for Greater Manchester for the past 8 years. My other role within NHS England GMHSCP is Clinical Advisor. I joined Grosvenor Medical Centre in 2010 and continue to juggle work and family life. I provide a full family planning service, and oversee our Anticoagulation clinic. To stay sane, I enjoy walking, dancing, crafts and spending time with my lively son! 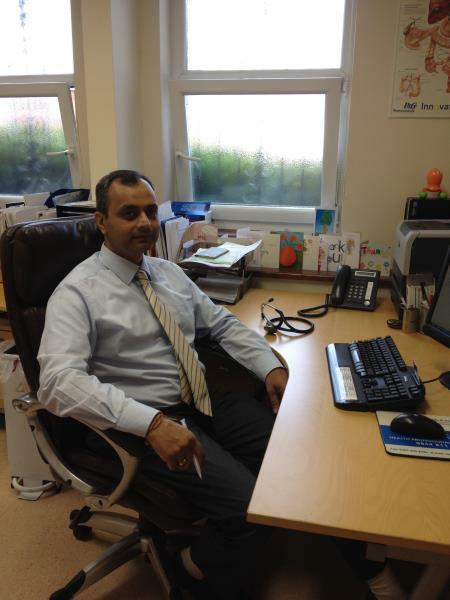 I completed my medical degree at the University of Manchester in 2006 and joined the surgery as a salaried GP in 2012. My main areas of interest are mental health, cancer and palliative care, and I also work part-time at Willow Wood hospice. Outside of work I am a keen amateur baker, I attempt to run regularly after recently completing the NHS CouchTo5K program, and most of all love spending time with my friends, family and young son. Practice nurses are qualified and registered nurses. They can help with health issues such as family planning, healthy living advice, blood pressure checks. The practice nurses run clinics for long-term health conditions such as asthma or diabetes, minor ailment clinics and carry out cervical smears, travel injections along with child and baby immunisations. Healthcare assistants support practice nurses with their daily work and carry out tasks such as phlebotomy (drawing blood), Warfarin clinics, blood pressure measurement, ECG recording, ear syringing, Flu Jabs and B12 injections along with new patient checks. They may act as a chaperone when a patient or doctor requests one. The administrators are responsible for the daily paperwork and prescriptions to be processed. They also arrange the Patient Participation Group meetings, manage the noticeboards and the Practice Website. Receptionists provide an important link for patients with the practice and are your initial contact point for general enquiries. They are trained to direct you to the most appropriate clinician and may ask you a few general questions to ensure you are promptly signposted to the correct member of staff. They can provide basic information on services and advise if results are back and direct you to the right person depending on your health issue or query. Receptionists make most of the patient appointments with the GPs and nurses. They also perform other important tasks such as issuing repeat prescriptions and dealing with prescription enquiries, dealing with financial claims, dealing with patient records and carrying out searches and practice audits. Responsible for processing medical forms for outside agencies, private letters, referrals via e-Referral Service, along with other general secretarial duties. The midwife runs an ante natal clinic by appointment on Wednesday afternoons 14:00 - 16:00. Emergency only contact number is 0161 331 6000. Available at Stalybridge Clinic or Dewsnap Lane Clinic. Tel 0161 366 2120.